Ready to test your knowledge of acids and bases with a few practice problems? 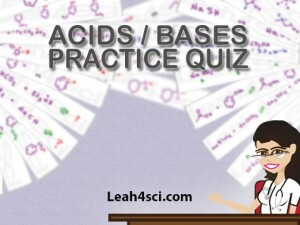 This quiz is designed to follow my Acids and Bases tutorial video series. But I’m not looking to see if you simply ‘memorized’ the concepts. The videos use simple examples to demonstrate concepts, these questions will test you at a slightly higher level. So give it a shot, see how you do, then download the solutions at the end of the quiz. Be sure to grab the Acid/Base Cheat Sheet to help you along. Which is the stronger acid? Rank the following ionic compounds in order of increasing base strength. Which of the following is the stronger acid? Which of the following forms a stronger acid upon reacting with a proton? Rank the following in order of increasing acidity. Which of the following forms a weaker conjugate base? Which of the the labeled protons is more acidic, and why? Rank the labeled protons in order of increasing acidity. Which is the stronger acid and why? Which forms a weaker conjugate base and why? Rank the following in order of increasing acidity. Use resonance to back up your explanation. Don’t just right to t he solutions. Instead challenge yourself to try every question first. I have an exam coming up and your videos as well as this quiz really helped me make sense of some concepts I have been having trouble with. Thank you! Plz send me your email id. I have not received the PDF solutions for this quiz. I’m not sure if I am doing something wrong but I have tried numerous times. Have you checked your spam folder? You may try a different email if it still doesn’t come through. Hello Liah I haven’t received any email for the solutions despite clicking on the link and giving required information. Can u mail it to me or give me ur email address? I can’t find the quiz solutions. Where are they? Hey Leah, the email won’t send for the acid and base solutions of the quiz. If you can email it to me that would be great! Hello, I have a question on number 4.I understand how the higher the Ka, the lower the pKa, and so the stronger the acid. But, the Ka of HF is higher (^-4) than the Ka of CH3OH (^-16), meaning that the pKa of HF will come out larger than CH3OH and so becomes the stronger acid. But, the answer is CH3OH. May you explain this please, thank you. Yes, i did but i stil confused. Because I think that Nitrogen (with the (+) charge) which can pull the electrons towards it, and make the conjugate base be more stable. Because I saw on your quiz solution you said that m-nitrobenzoic acid is the weakest while we compare the acid strength among m-Nitrobenzoic acid, benzoic acid and m-methyl benzoate. Did you check the quiz solutions?